Earlier this week, I let Amber play with the laptop for a little while. She loved it and was so excited to bang on the keyboard and watching her got me thinking...what will the tech landscape look like when she's old enough to notice? I wrote a short story when I was 12 using Creative Writer and Windows 95. That was only 15 years ago. By the time Amber is 10, what will the tech world look like? Some of the things that I remember thinking were so amazing seem ancient now. Let's take a look at some of my nostalgic tech memories. In Part 3, I'll make a few observations about what the world might be like in 10 years. I have always been a mobile device fan. 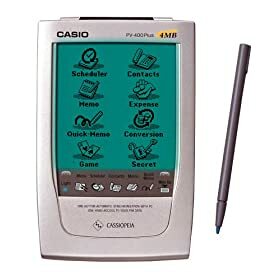 I got my first PDA, a Casio PV-400, when I was 12 or 13. Since then, I've had a laundry list of devices, culminating in the G1 I have now. With my old devices, like Palms and Pocket PCs, the defining factor was the sync. I'd get home, snap it into the cradle, and the magic would happen. I remember being so excited about the idea of synced emails. I could write an email on the device, and then when I got home and hit the cradle, it would sync and send. In today's world, that's unheard of and the concept of email being anything but immediate is laughable. Way back when, I remember reading an article that said we'd have online applications in the future. The author said that, someday, we'd no longer visit a store to buy boxes and discs, but instead we'd visit a website for our application needs. I vividly remember thinking, "yeah right, like that'll ever happen." But today, that's becoming the norm. Aside from specialty applications like photo and video editing, all my work is done online. While hard drives certainly haven't become free, the notion of constantly monitoring your available storage has all but vanished. I remember it, though. Always needing to delete things to free up space, not being able to save large files, etc. Even email had very limited storage when I first started using it. I honestly wonder what Amber will think when she first experiences a phone that's tethered to the wall. Or a phone that's shared by more than one person. Phone numbers are quickly becoming individual identifiers with a number following a person, not a location. Then there's the extra features that have become the norm, like caller ID. I even remember answering machines with those annoying little tapes inside. I vividly remember the days of analog pictures and video. Having to wait for pictures to be developed, not knowing if the shot looked good right away, etc. And with home video, you had to deal with tapes...rewinding, scrubbing, etc. Less than ideal. Today, though, it's all immediate. Even very young children know this. Next time you're at a party with 2 or 3 year olds, notice what happens when you take their picture. They immediately say, "let me see it!" The notion of not being able to see the picture immediately doesn't even enter their minds.